Since October 1st is the feast day of St. Therese of Lisieux I decided to start my 31 Days of Europe with my Pilgrimage to Lisieux. When I planned my trip to Europe I wanted to go to Paris for two reasons and they had nothing to do with any of the sights in the actual city as many people tried to sway me otherwise because of how rude the Parisians are to Americans. Which surprisingly enough we did not really experience. One reason was that I wanted to go to Disneyland Paris!! The disney addict in me wanted to experience another disney park! That post will come later in the month. But the main reason was that Paris was only a two hour train ride from the tiny french town of Lisieux. St. Therese of Lisieux (also known as the little flower) is a very popular saint and was from this tiny town. St. Therese is my confirmation saint and really when I chose her I didn’t know a whole lot about her. Honestly I was 14 and didn’t do much research when I had to pick a saint. I LOVED the name Teresa and wanted a saint of the same name. My mom told me my dad really liked St. Therese the little flower so I chose her. I remember St. Teresa of Avila was also a possibility. However, I really think God knew what he was doing when I chose St. Therese (and am convinced my dad had a hand in it). As the years have gone by I have always collected her stuff. I have statues, bookmarks, books, and pictures of her. I really love how she does little things and was able to make a big impact. As an introvert I’m really able to connect to this. I have recently learned that she is known as the patron saint for writers. So as a blogger I really enjoyed learning that. The day we had planned to go to Lisieux it was was chilly and drizzly. 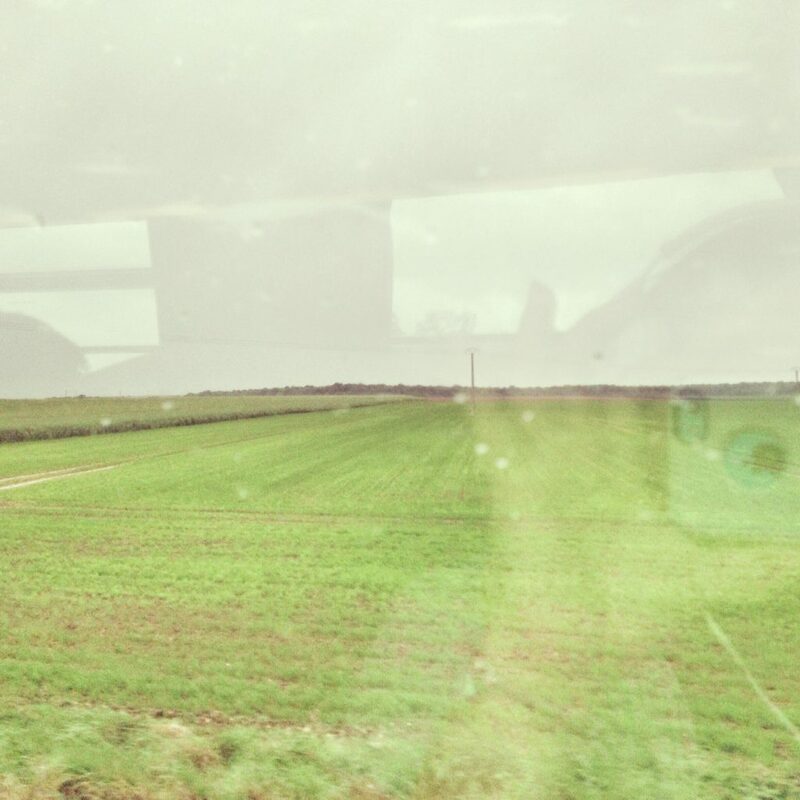 The train ride was pretty uneventful and empty but the scenery was really pretty and so green!! 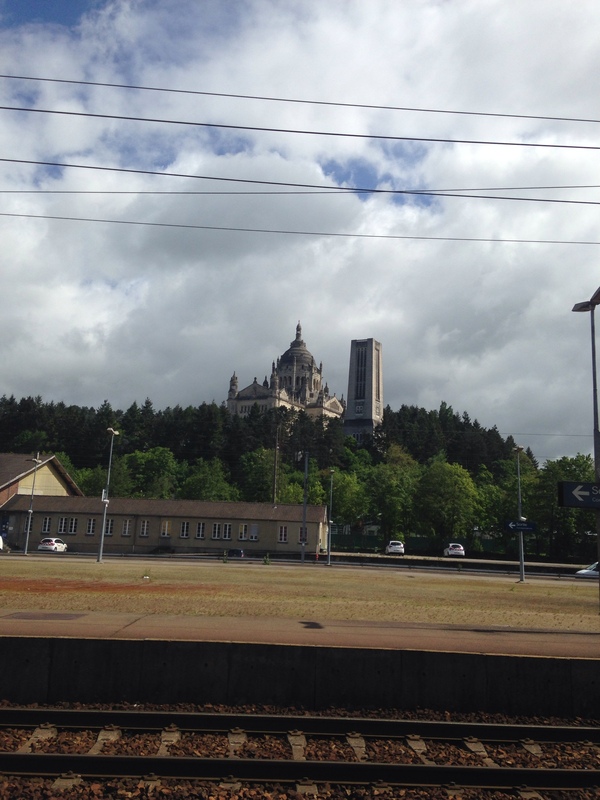 When you get off the train the Basilica of St. Therese is the first thing you see! To get to the church from the train station you walk up the hill through a charming little French town. As we were walking through the town my mom and I talked about all the people that make a pilgrimage come to this town just to see the Basilica. When I was researching this trip tripadvisor was my friend and I found several threads about people wanting to know how to get to Lisieux to visit St. There’s birthplace. It’s really something when you think about it. Finally we arrived at the church and it was HUGE!! My mom took a picture of me standing on the steps into the church (which I couldn’t find she probably has it on her computer) and you can’t even see me I’m so tiny! First we went downstairs into the Crypt. They had display cases and posters that portrayed Therese’s life. I knew most of the facts but it was nice to revisit them. My mom never realized she was only 14 when she wanted to become a nun! I can’t imagine being that young and knowing exactly what god wanted me to do. Heck at 14 I didn’t even know where I wanted to go to college! Afterwards we went upstairs into the main sanctuary. The gothic cathedrals are really interesting. They have these mini side altars all along the sides of the church dedicated to different saints or people or things. I had never been in a cathedral like that before this trip. Off to the side we lit a candle and said a prayer to St. Therese in this area. It was so beautiful. Really this church was beautiful I was in awe the entire time! 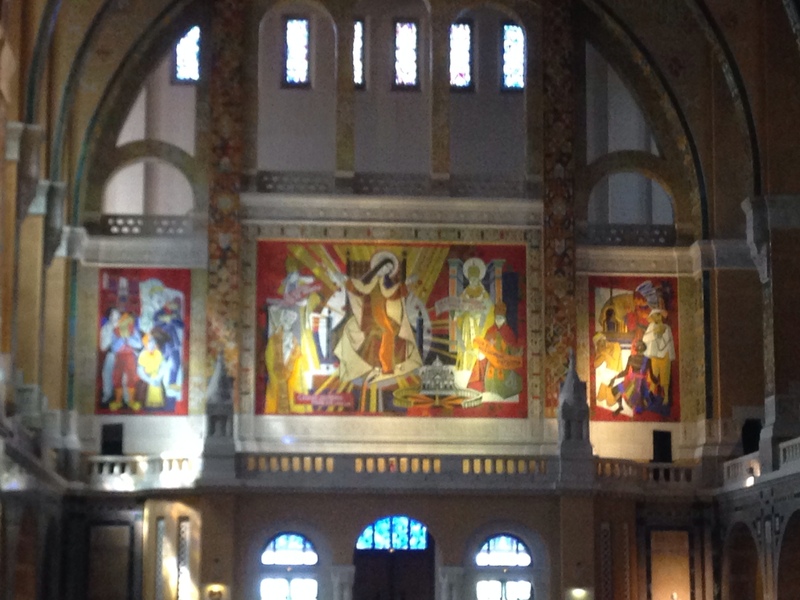 My favorite part of the church was this mural in theback of the church that you see as you walk out. We were looking at it and this man was standing near us and started telling us all these things about it in French. Then I think he realized we had NO IDEA what he was saying and asked us if we spoke like 3 other languages before English and he just said something along the lines of how beautiful it was and that was Mary….and how beautiful the entire church was. After we finished inside the church we went over to the gift shop (of course). 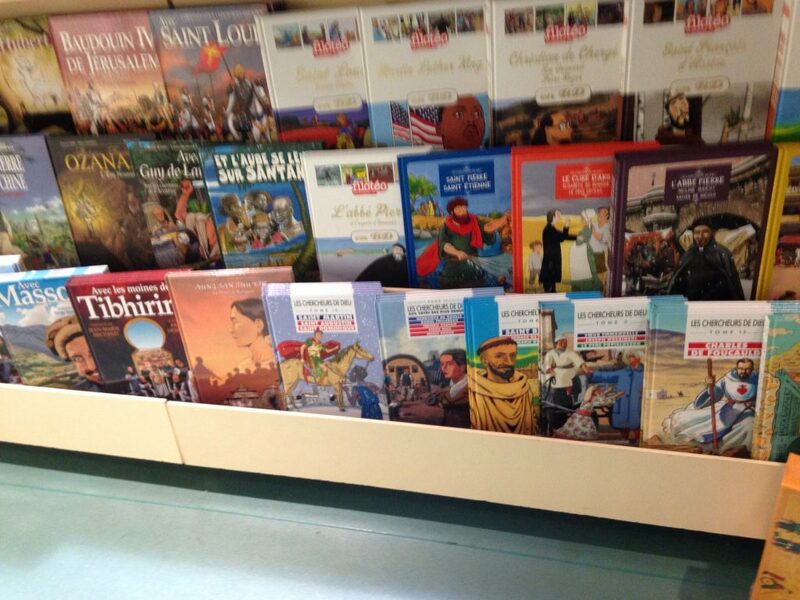 They had all these cute catholic children’s books/activity books/coloring books in the store. I purposely took a picture because I wanted to prove that other languages have cool catholic books for kids that I always have trouble finding in English. Or maybe I’m just weird. 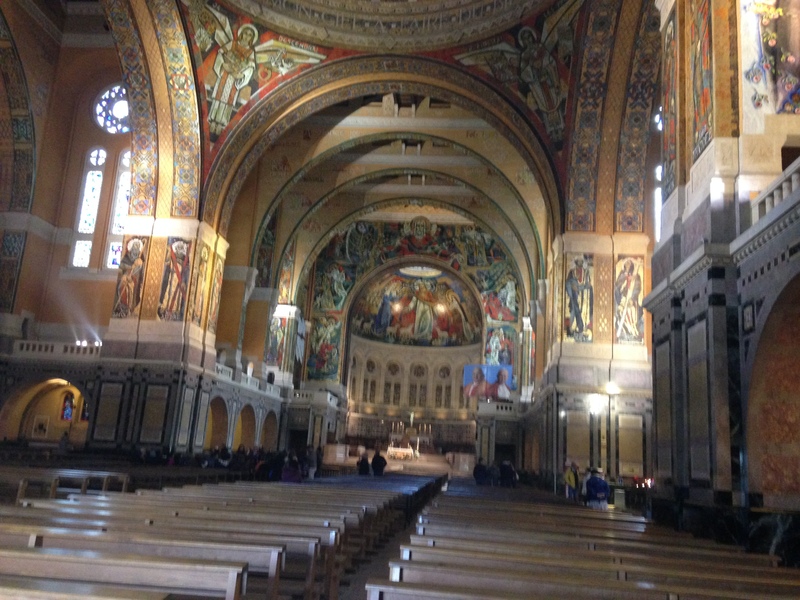 In my recap of my trip to Europe I said that Rome WASN’T the most catholic/spiritual place I visited and it was Lisieux and Assisi. It’s hard to describe it just was. It was a beautiful little town. 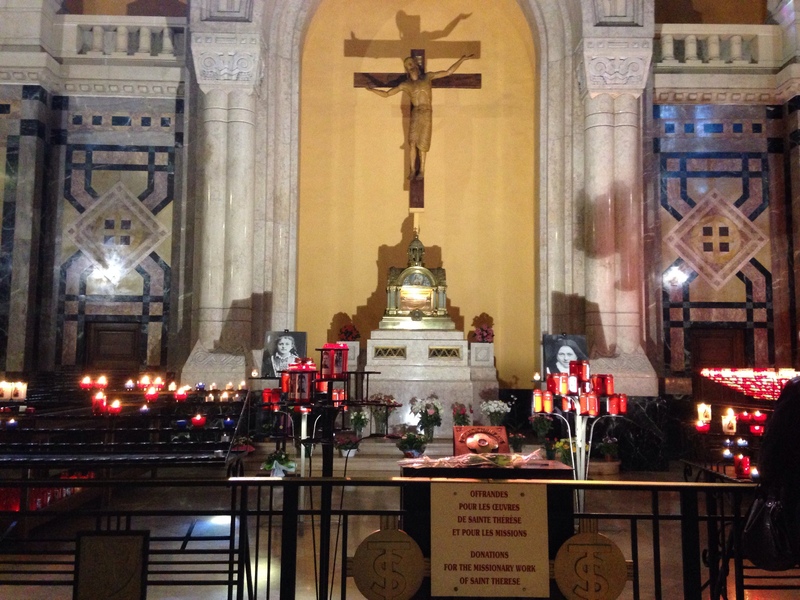 You can just feel the presence of St. Therese’s work in the church. Tons of people got off the train went up to the basilica toured the town and got back on the train. The people did the same thing in Assisi, Italy. I think part of it is you don’t have all the tourism and people you have in the big city of Rome and Paris and people who are visiting because “it’s the thing to do.” The people visiting these places truly have a connection to the saint and want to be there. My devotion to St. Therese has grown even more since coming back from Europe. The picture of the Basilica is still my wallpaper on my phone. I think about my experience there all the time. 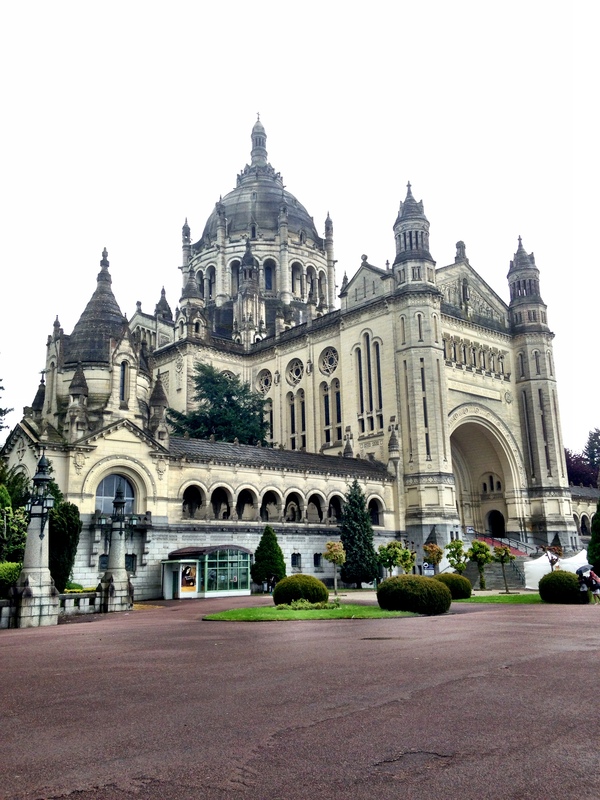 If you ever get a chance to visit Paris and have a devotion to St. Therese take the time to take the train to the little town of Lisieux and visit the quaint little french town, you won’t be sorry. 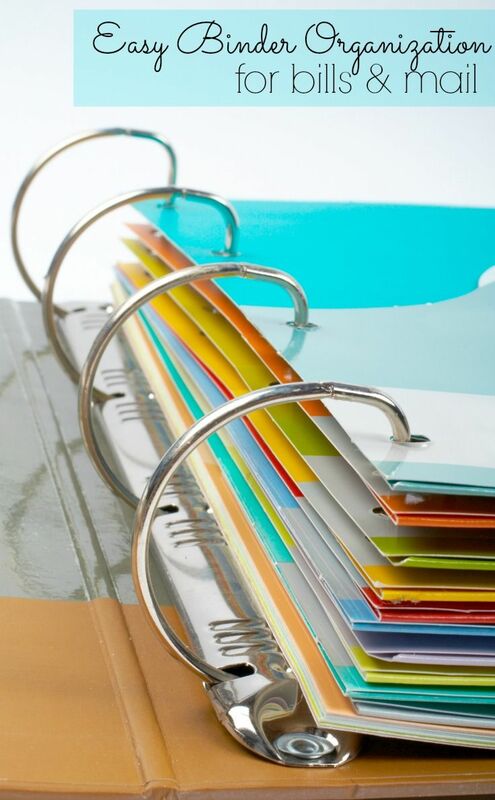 Fall Into Blogging Mega Giveaway! Beth Anne! 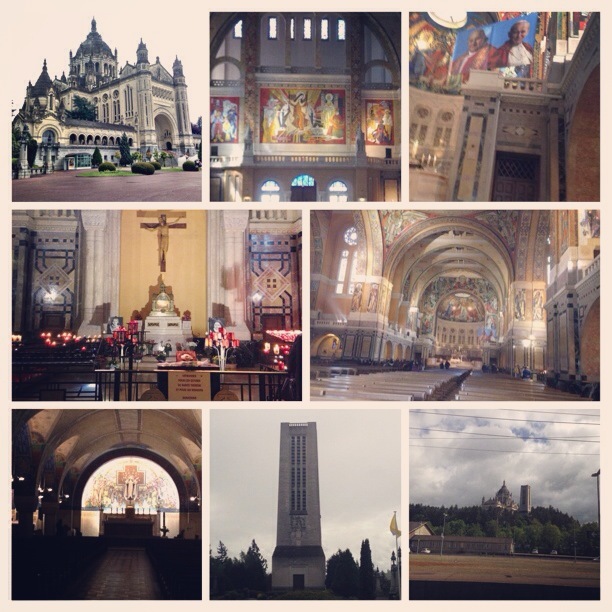 How beautiful your trip to Lisieux was! Thanks for sharing! What a treat to read, Beth Anne! 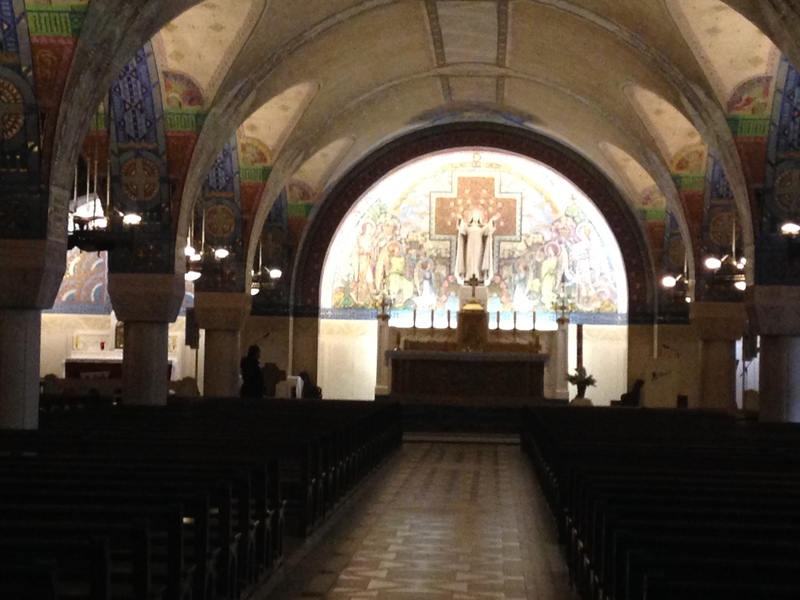 I went to Europe before my big reversion to the Church; so, I went to some very special places, though common. How wonderful to visit Lisieux when she is such a favorite of yours! 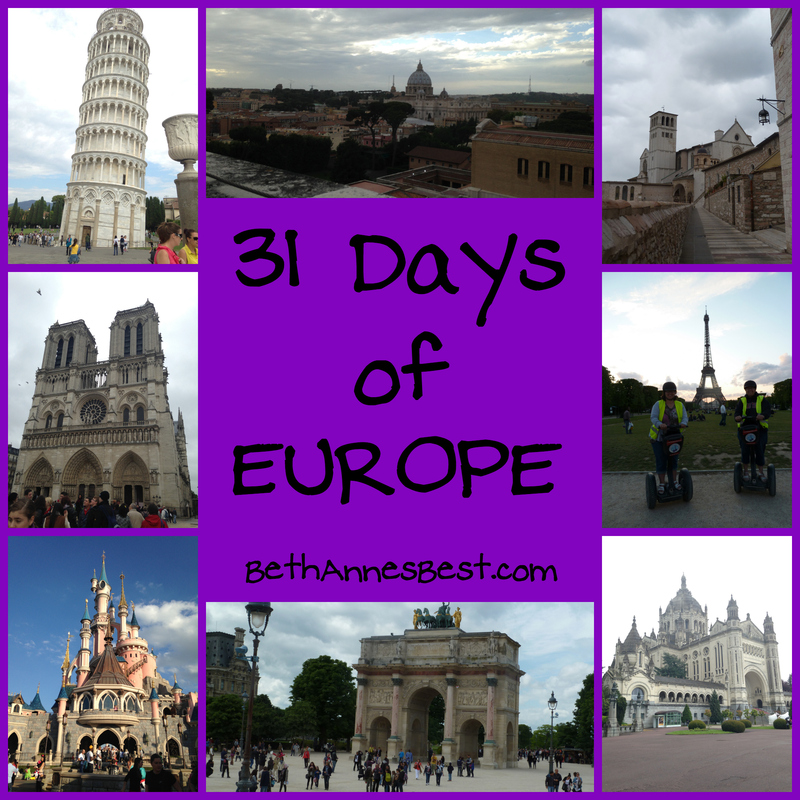 I think a second trip to Europe would be different! Thanks for sharing.